My TV watching stream is feeling a little empty today, so I have been searching for the best shows like Pretty Little Liars and Gossip Girl. Chances are pretty good if you’re a fan of either Pretty Little Liars or Gossip Girl, you’ve seen them both! (and if you haven’t then you should because ah-mazing!) 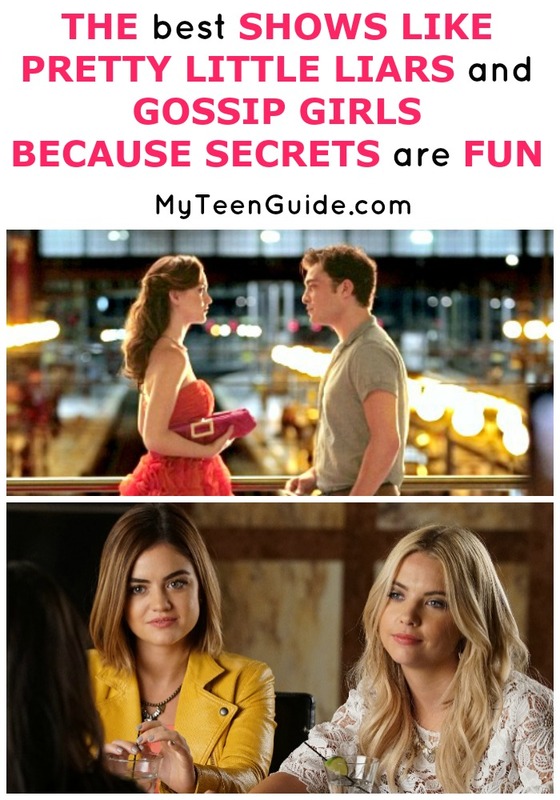 If you’re ready for more drama, secrets and mystery you need to check out some of these other shows like Pretty Little Liars and Gossip Girls. I *may* have binge watched a little extra to write this post. You know, because I care about you! 🙂 I’ve also included which of these are shows to watch on Netflix because we all want the best shows on Netflix on our lists anymore! See my picks below, plus more info about Pretty Little Liars and Gilmore Girls so you can catch up! Pretty Little Liars is a teen television series that combined thrills, mystery and drama. The show premiered on June 8, 2010, and starred Troian Bellisario as Spencer Hastings, Ashley Benson as Hanna Marin, Lucy Hale as Aria Montgomery, Ian Harding as Ezra Fitz, Shay Mitchell as Emily Fields, Sasha Pieterse as Alison DiLaurentis and Laura Leighton as Ashley Marin. My friends and I are obsessed with this show! If you want the best shows on Netflix, this tops the list. On Pretty Little Liars we follow the lives of four friends who team up to battle someone who wants to spill their deepest, darkest secrets. Gossip Girl was a teen drama television series that aired from September 19, 2007, to December 17, 2012. The show starred Blake Lively as Serena van der Woodsen, Leighton Meester as Blair Waldorf, Penn Badgley as Dan Humphrey, Chace Crawford as Nate Archibald, Ed Westwick as Chuck Bass, Kelly Rutherford as Lily van der Woodsen and Matthew Settle as Rufus Humphrey. Gossip Girl showcased the lives of privileged teenagers who are constantly being watched by a ruthless blogger. This has to be one of the best shows on Netflix. The Lying Game was a teen drama television series that aired from August 15, 2011, to March 12, 2013. The show starred Alexandra Chando as Emma Becker, Andy Buckley as Ted Mercer, Allie Gonino as Laurel Mercer, Alice Greczyn as Madeline Rybak, Blair Redford as Ethan Whitehorse and Helen Slater as Kristin Mercer. The Lying Game followed the life of a sweet foster girl who discovers that she has a twin sister who is her identical twin. This show is really good, but unfortunately is not on Netflix, boo. Vampire Diaries is a teen supernatural drama television series that premiered on September 10, 2009. The show stars Paul Wesley as Stefan Salvatore, Ian Somerhalder as Damon Salvatore, Kat Graham as Bonnie Bennett, Candice King as Caroline Forbes and Zach Roerig as Matt Donovan. Vampire Diaries showcased the life of Elena Gilbert, who is in love with two vampire brothers: Stefan and Damon Salvatore. You’ll find this show on Netflix, wahoo! One Tree Hill was a television drama series that aired from September 23, 2003, to April 4, 2012. The show stars Bethany Joy Lenz as Haley James Scott, Sophia Bush as Brooke Davis, James Lafferty as Nathan Scott, Lee Norris as Marvin McFadden, Paul Johansson as Dan Scott and Chad Michael Murray as Lucas Scott. One Tree Hill showcased the lives of Lucas and Nathan Scott, two half-brothers who are friends yet also enemies and competitors. You can watch and rewatch all of these episodes on Netflix. This one is climbing on my personal list of best shows on Netflix. I think I need to get further into it; I know a lot of people who srsly love this show. So lovelies, do you have other ideas of the best shows like Pretty Little Liars and Gossip Girl? What are your fav shows full of drama and secrets? Tell me in the comments!